Sites with shallow bedrock are defined as having bedrock within 6 feet or less of the ground surface. Shallow bedrock is found in many portions of the state, but is a particular problem in the northeastern region. 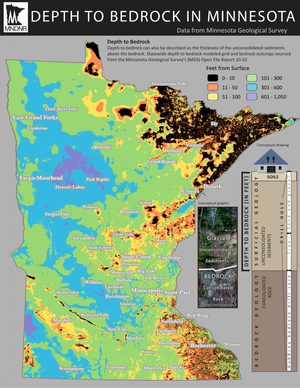 When installing an infiltration Best Management Practice (BMP), there must be at least 3 feet of separation between the base of the BMP and the bedrock per the Minnesota Construction General Permit (CGP). Bedrock at the 6 foot depth is a trigger to perform a geotechnical investigation to determine the location of the bedrock in the area in and around the proposed BMP to ensure the 3 foot separation can be achieved. 1 Why is shallow depth to bedrock a concern? 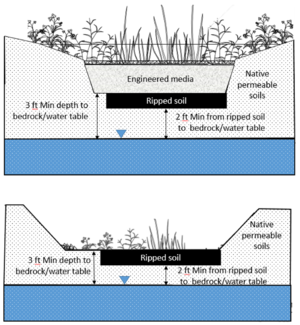 3 What are general stormwater management guidelines for areas with shallow bedrock? Why is shallow depth to bedrock a concern? Shallow bedrock limits the depth of BMPs, reduces the potential for subsurface infiltration, and reduces the depth over which treatment can occur. These sites present challenges to stormwater management; however these challenges can be managed. General guidelines for investigation and management are presented below. Special caution for steep slopes and fractured bedrock is urged. It is important to understand the general depth to bedrock over the entire site, but more specifically it is important to know the depth to bedrock in and around the area of the proposed BMP. Geotechnical investigations are recommended for all proposed stormwater facilities located in regions with shallow bedrock. The purpose of the investigation is to identify subsurface conditions which can pose an environmental concern or a construction hazard to a proposed stormwater management practice. Guidelines for investigating all potential physical constraints to infiltration on a site are presented in a table at this link. These guidelines should not be interpreted as all-inclusive. The size and complexity of the project will drive the extent of any subsurface investigation. All material penetrated by the boring should be identified, as follows. Identify soil characteristics including, at a minimum: color; mineral composition; grain size, shape, and sorting; and saturation. At least one (1) figure showing the subsurface soil profile cross section through the proposed practice should be provided, showing confining layers, depth to bedrock, and water table (if encountered). It should extend through a central portion of the proposed practice, using the actual or projected boring data. A sketch map or formal construction plan indicating the location and dimension of the proposed practice and line of cross section should be included for reference, or as a base map for presentation of subsurface data. What are general stormwater management guidelines for areas with shallow bedrock? The following investigations and guidelines are HIGHLY RECOMMENDED for infiltration and other BMPs proposed to be located in areas with shallow depth to bedrock. Conduct thorough geotechnical investigations in areas with suspected or documented shallow bedrock. Perform site geotechnical analysis similar to karst. Consider a non-infiltration BMP or moving the BMP to a location on site with sufficient depth to bedrock if the required 3-foot separation cannot be achieved. It may be possible to move the infiltration BMP to another location in order to achieve this separation. Consider shallow ponding depths up to 12 inches for filters, swales, and bioretention. Conclude that infiltration of stormwater runoff from stormwater hotspots is not feasible due to potential for connections with bedrock fracture zones. Consider stormwater wetlands which have shallower ponding depths than stormwater ponds. The disadvantage is that the shallow depths result in basins with large footprints which may not be feasible on small sites. The following table provides an overview of shallow bedrock and soil related design considerations for different structural practice groups. Guidelines for investigating all potential physical constraints to infiltration on a site are presented in the table at the bottom of this page. Recommendations for structural BMP use in settings with shallow soils and shallow depth to bedrock. Recommended practice in areas of shallow bedrock and soil. Will be limited due to minimum separation requirement. Surface area to depth ratios of practices may need to be larger. Arch pipe and other perforated storage "vault" practices can help increase treatment volumes within limited spaces. Use with PSHs should be carefully considered. Pre-treatment should be extensive to limit risk of groundwater contamination if groundwater is close to the land surface. Will have depth limitation to consider, making surface areas larger for a given storage volume. Shallower depths may be undesirable from an aesthetic standpoint, particularly if wide fluctuations in water level are expected. Applied more easily than ponds, but will also require larger surface area to drainage area ratios. 1A liner is required under the Construction Stormwater General Permit. This page was last modified on 11 July 2018, at 14:18.